Wal-Mart (s wmt) develops its digital initiatives and products not in the recesses of a 200,000-square-foot Supercenter or at corporate headquarters in northwest Arkansas. 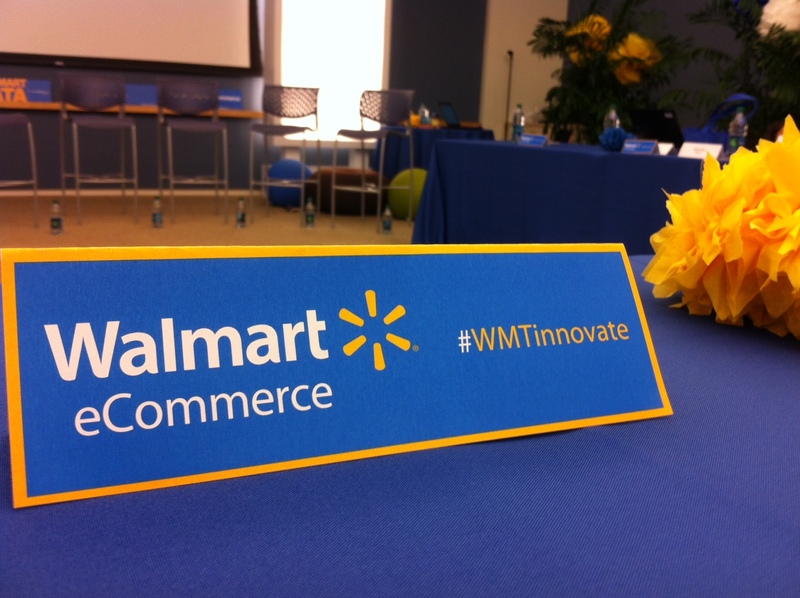 Innovations for the Walmart.com website come out of San Bruno, Calif., and Wal-Mart executives and media people didn’t try to hide a foosball tournament, a pingpong game and a hip-looking workforce during a media tour on Tuesday of the Wal-Mart eCommerce San Bruno facility. It’s proud of those status details and is actively pushing the startup narrative. Wal-Mart eCommerce is the largest startup in the world, executives said. Employees participate in hack days and work in small teams to launch digital products in months. But with 10,000 stores internationally, Wal-Mart is the largest retailer by revenue in the world — Amazon’s (s amzn) annual net sales is about 13 percent of Wal-Mart’s — and therefore has much to lose. Fierce online retail competition from Amazon, Google (s goog) and others pose challenges, as customers have no problem buying from a different company if the price and the product are right. As same-day shipping and other retail breakthroughs become possible, the Wal-Mart eCommerce crew is taking steps to do as good of a job or better of meeting customers’ retail needs online as it does in store, and it’s also trying out the sorts of projects that could secure repeat business from a more up-market crowd. How? Employees in San Bruno are adding features to desktop, tablet and mobile web presentations. They’re letting internal buyers take advantage of real-time social-media activity, sales information and other data. And they’re building out an international development platform that will be common to all the tech stacks under the Wal-Mart Stores umbrella, enabling quicker deployment of more useful searching and browsing tools and other online features. Last year Wal-Mart premiered a fine-tuned search engine called Polaris. The search engine has since increased sales resulting from search engine use by 20 percent, said Joel Anderson, president and CEO of the United States Walmart.com site. 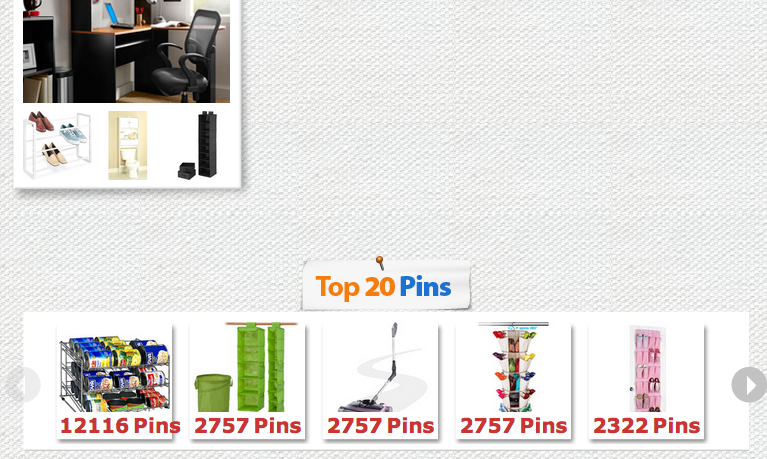 Category-specific pages that came out on Walmart.com last year display the products available through the site that got the most pins on Pinterest. Later this year the model will become more powerful and widely available. Customers will be able to see the top products and colors being pinned on Pinterest, for example. Wal-Mart has been throwing resources behind search-engine optimization, too, to make sure consumers can spot its websites and products in the first place. A forthcoming Walmart.com mobile app will let customers speak into their mobile devices or scan barcodes on products at home to start shopping lists. When customers enter stores, the app will display the aisles where desired products sit on shelves. It also will allow customers to summon associates for assistance, apply coupons, scan items for prices and store digital copies of receipts. The existing Scan & Go feature, which entails scanning everything while walking around a store and then using a smartphone to transfer the order to a register, has caught on with customers, and Wal-Mart is tripling the number of stores where it’s possible, to more than 200. @Walmart Labs acquisition of Grabble laid the groundwork for this technology, and now Wal-Mart is building on it. Wal-Mart’s buyers can get a sense of what they should stock online and in stores by checking out pins on Pinterest. 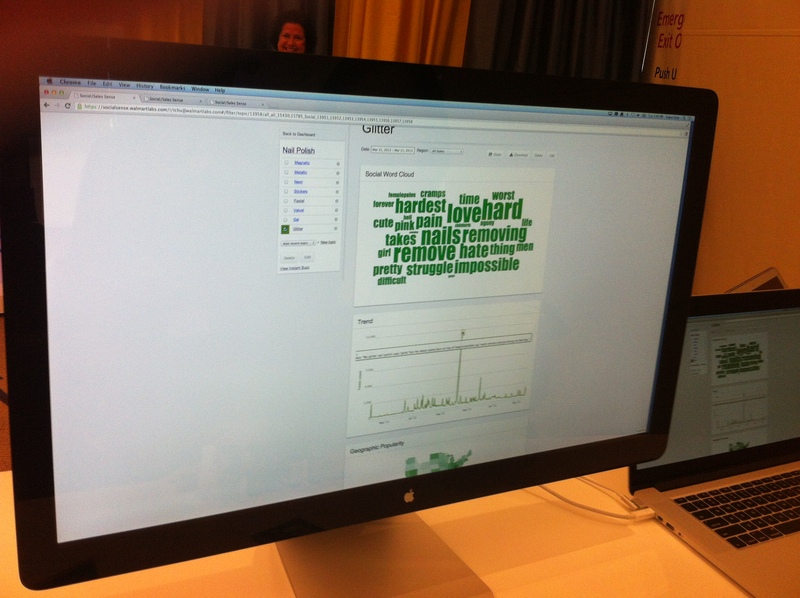 Top pins feed in to a new social-media analytics dashboard for buyers. So do reports from Twitter that engineers have carved out from the entire Twitter firehose, allowing for better insight into consumers’ thoughts on products. They can see when the number of tweets on, say, gel nail polish peaked and see which colors were the most popular in which locations. On top of that, Wal-Mart’s buyers have access to sales data, which they can overlay on top of Twitter graphs. That way, they can anticipate demand and respond to it with supply. The social feeds show buyers the desires of more social media-savvy customers, so buyers can venture beyond traditional top sellers with a bit more assurance of what customers say they want. For years, engineers on the back end of Walmart.com, Sam’s Club and other online entities of Wal-Mart Stores subsidiaries have worked with a wide variety of software, and now they are unifying it all on one simple in-house platform called Pangaea. Engineers are “trying to set up systems that will connect every product in the world with every customer in the world,” said Jeremy King, senior vice president and chief technology officer of Wal-Mart Global eCommerce. And that means technology needs to be uniform for desktop sites, mobile sites and stores. As online and offline orders come in around the globe, Wal-Mart needs to be able to track inventory and move around products on the fly. That ability has been introduced to Sam’s Club and other properties, and it’s now being expanded. Different sites have different methods of operating shopping carts, checkout, payment, fraud, tax, personalization and wish lists, often relying on third-party offerings. “All these sort of core capabilities … are being built,” King said. But there needs to be wiggle room. In some countries, customers don’t plunk down the total amount for a big purchase, such as a television; rather, they pay in installments. Sites need to be able to handle a variety of payment structures. Pangaea will also enable Wal-Mart subsidiary sites around the world to take advantage more easily of the algorithms and user-experience improvements coming out on Walmart.com. The advantages can benefit operations internally, and customers can get better service, too, said Sri Subramaniam, vice president of @Walmart Labs. At first, the whole startup vibe evident at Wal-Mart eCommerce is jarring, because it’s so different from the conventional Wal-Mart retail experience. But the Wal-Mart annual report released Tuesday suggests that the company is heading in the right direction. The company posted $466.1 billion in net sales in its fiscal year that ended on Jan. 31. The United States portion, comprising 59 percent of net sales, was up almost 4 percent over the previous year, beating the roughly 1.5 percent rise from the fiscal year ending Jan. 31, 2011, to the one ending in 2012. To ensure that Wal-Mart Stores doesn’t lose customers to Amazon and others, the company will have to keep improving its digital front and back ends. Scalability challenges make it interesting to watch on the tech side, and Wal-Mart competitors could pick up some ideas, too. The question is what customers will think of it all. I love the idea of connecting offline and online shopping experiences. I think they way walmart is going is the future of all major retail stores across the world, where particularly in Europe malls are losing clients to online stores. So having both a physical store front and a virtual one is key to success in the future. Glad to see continued innovation in the space – perhaps our functionality of group purchase socially shared would be the future here – we’re in beta at Flash Purchase.